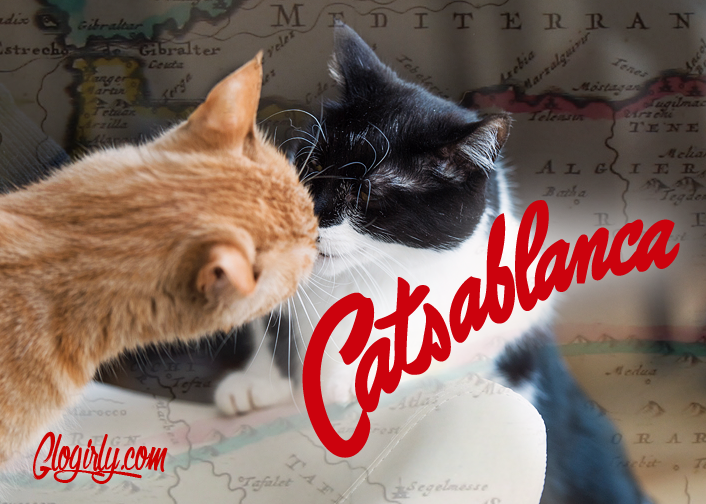 KATIE: –case of mancat cooties! What are you doing, Waffles??? WAFFLES: Lack toes? One, two, three, four... I'm not missing any toes, Boss. HALO (left): Buy me a drink, handsome? 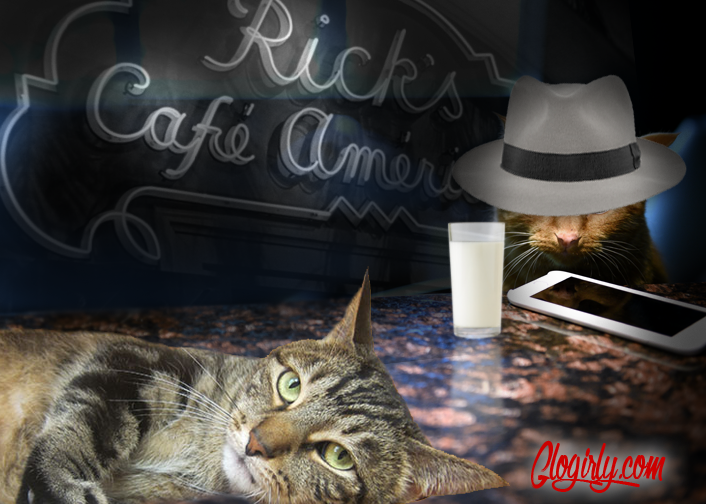 Welcome to Caturday at the Movies with the Shelter Cats! If you're a regular visitor here on Saturdays, you're probably familiar with our #TVTripCaturday blog series featuring classic TV spoofs and adoptable cats from our friends at PAWS Pet Animal Welfare Society in Norwalk, CT. Grab your popcorn because we're going to the movies! 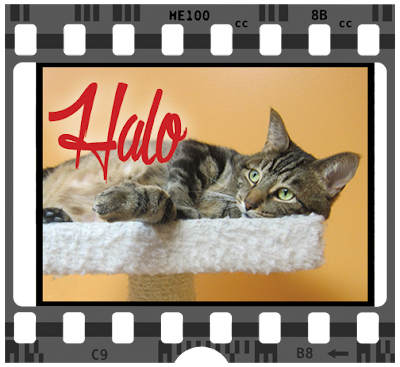 Through the magic of Photoshop, an adoptable cat from PAWS will join Waffles and Katie for some cinema-fun as we "catify" our favorite movies. Beautiful tabby Halo has had a hard knock life in her three short years. If you meet her, she’ll tell you all about it. She loves to talk! First there was life with a hoarder. Then there was a very bad flea infestation (don’t worry, her coat is coming back beautifully). Halo’s luck turned from bad to good when she was brought to PAWS. Halo would love to be your one and only. She doesn't much like other cats... who can blame her considering all she's been through. Some of the cats at PAWS are caged because they really don't like other felines. Beautiful Halo is one of these. And who can blame her considering all she's been through. When it's her time to come out of the cage, she leaps straight to the top of the cat tree where the fleece pad is soft and the view is nice. She's ready and waiting for you at PAWS, Pet Animal Welfare Society in Norwalk, CT.
Poor Halo, being stuck in a cage. I hope she finds her own home soon so she can be cage-free! The last cat my parents had, Shiimsa, had to be only cat because of how timid and submissive she was. The other cats in her foster home would beat up on her, so she was kept in a three-level cage. When my parents adopted her, once she was certain there weren't any cats around to beat her up, she became quite the sassy little Queen of the Apartment and had my parents wrapped around her paw. Inspired. Halo you are THE most gorgeous girl!! Humphrey Go-Cart? Glogirly, you have reached new heights of funny with this one. I wish I could talk to the PAWS cats and explain that they could be cage free if they changed their attitude. Even better, I'd like to give them pointers on attracting adopters! But we just have to be thankful that they are in a safe, caring, no-kill shelter for now. Halo is a mighty fine kitty too. We purr she will get her very own home soon. Halo is a very nice kitty, and she will make a great BFF for some lucky human. Thank you for featuring her! Poor Halo, I hope she gets her forever home soon. 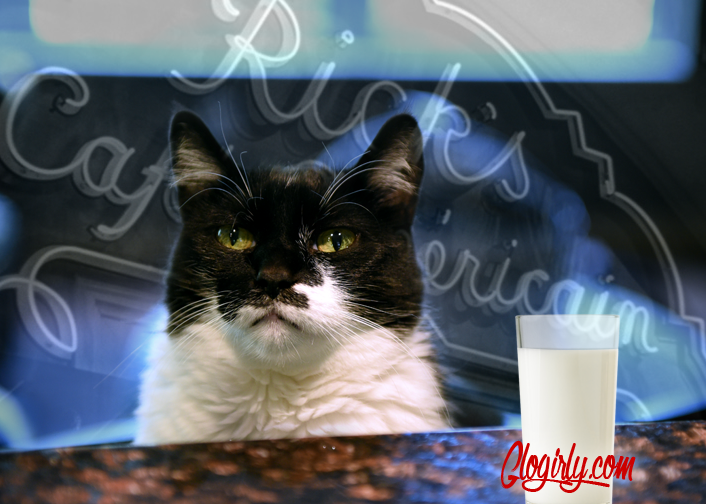 Halo we hope you can find love at Rick's American Cafe and oh a forever home too! Bless the PAWS people for taking care of Halo..even though she has a cage..at least she is not in a bad situation anymore..You are a beautiful tabby girl Halo...and I love your name! I hope that sweet darling gets a loving home where she never has to go in a cage again. I think you make a mighty fine Bogie Waffles. I hope Halo gets out of her cage and into a loving home. OMC Da angle of da camerwa weally puts yous in a compurrmisin' pawsition Katie. MOL Bet Waffles is luvvin' it. Dat Halo sure is a cutey. 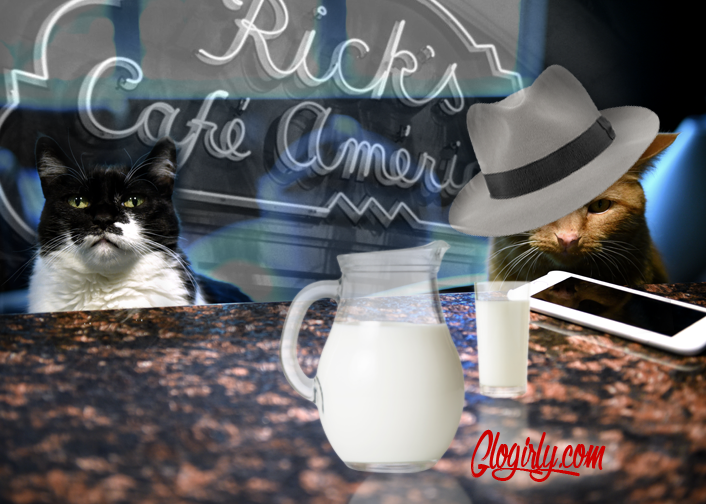 Weez sharin' and purrayin'. Aw, Halo is so sweet. We're purring that she can find her furever home soon. OMG!!!! A kiss!!! We pray Halo finds her furever home very soon. Here's looking at you kits! Hi Halo, you’re a cutie. Steer clear of the orange guy. He’s the love ‘em and leave ‘em type of cat. I love Caturday!! More kitties to help find their loving forever home. I'm sharing Halo and I'm sure this beauty will find her forever home.